Amplify Marketing Management was born in the mountains surrounding Whistler, British Columbia, infused with passion and combined with years of successful on-the-ground marketing experience. We genuinely enjoy sharing our knowledge with businesses that want to grow by helping them solve their marketing challenges. Amplify Marketing Management is led by Meredith Kemp, a senior marketing strategist with over 15 years of experience combined with a lifelong passion for skiing, mountain biking, and the outdoors. Amplify Marketing Management will collaborate with your existing team, or we can pull from our network of talent to ensure that your project is done right. Our goal is to provide a fresh, thoughtful, and strategic perspective while respecting the contribution each person in the marketing process brings to the table. Whether providing trusted advice, sharing best practices, delivering project management support, or developing your marketing strategy, we want to understand your business from you and your customers’ perspective in order to create the best results. Meredith was the Brand Marketing Manager for Whistler Blackcomb (2006-2013) where she was responsible for making sure the brand remained relevant throughout its marketing and made an emotional connection with consumers in both summer and winter. She was a part of the marketing team that launched the PEAK 2 PEAK Gondola, as well as the successful Embedded and Wonders campaigns. Meredith also worked with Retail & Rental, Food & Beverage, Employee Experience, Snow School divisions at Whistler, and the Whistler Bike Park to develop their marketing strategies, campaigns, and projects. 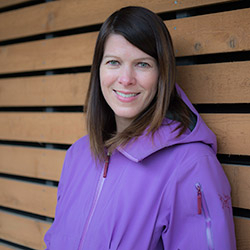 Meredith has been a member of provincial and national level ski industry marketing committees tasked with growing the sport of skiing in Canada and increasing skier visits to BC. She has spent time on the “agency side” with Traction Creative (owned by Wasserman and Partners), where she worked with clients such as the Four Seasons Hotel, the Sundial Boutique Hotel, the Nita Lake Lodge, and the Blackcomb Lodge. Before realizing she had a love for the outdoors that she would not “grow out of”, Meredith began her marketing career in the technology industry with Corel Corporation in Ottawa.